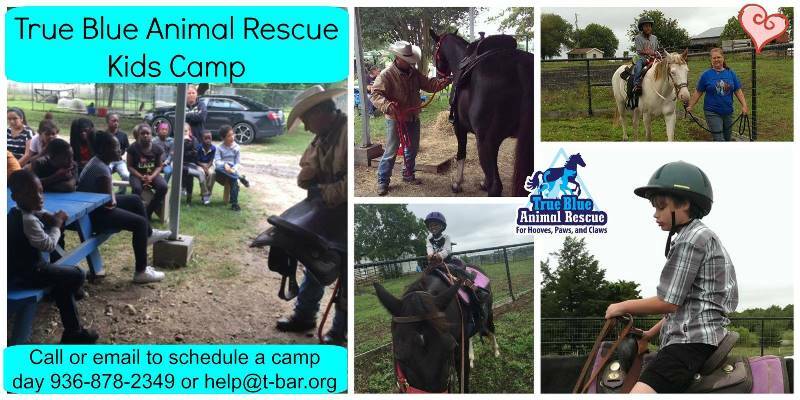 The rain finally subsided and we were able to have our third grade Read to Ride day at True Blue Animal Rescue. 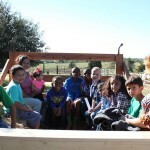 These students from Alton Elementary School in Brenham read a book and wrote a report over Christmas break in order to come out and ride a horse and enjoy a hay ride. This reading incentive is also a wonderful opportunity to educate children about animal care and to help them develop compassion and empathy for animals. The horse that had the biggest impact was our biggest horse, Roman. This beautiful senior boy teaches the students how kind and gentle such a big horse can be. 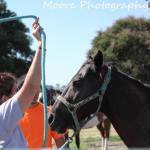 As a senior horse he requires a special diet and the children learn about that too. 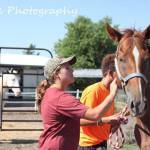 They learn about teeth floating and hoof trimming as part of horse care and needs too. 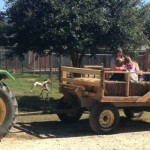 While some of the children are riding and interacting with horses the others enjoy a hay ride. This allows a great opportunity for nature watching and just silly fun and laughter. As you can see from the pictures the students and volunteers had lots of fun. 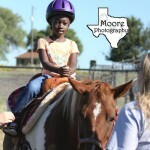 Stay tuned for more read to ride camps this summer and next school year too. Our goal is to increase these educational programs each year so we can reach more students every year. 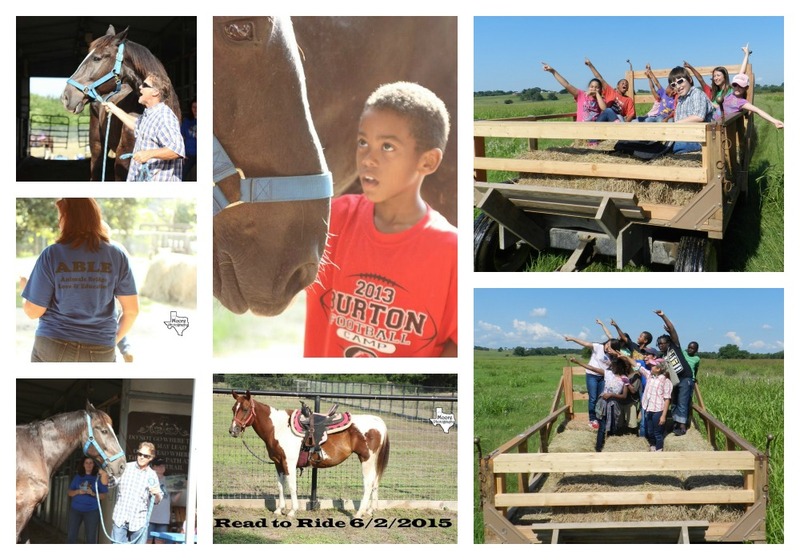 Third and Fourth Grade students from Alton Elementary School in Brenham, TX who read a story and wrote a summary about the book over Christmas break earned the opportunity to go to TBAR Ranch! This year 28 4th grade students and 18 3rd grade students got to come out and enjoy this fun filled educational opportunity. 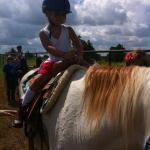 The event includes reading age appropriate rescue stories, riding horses and going on a hay ride. Hands on interactions like these build self esteem, teach about animal care and help our children become better pet owners and future advocates for animals. When you add in the book component, we’re building their reading skills too! As an Elementary School teacher this adds even more to the intrinsic value of this event. These pictures are of the fourth grade students that came out on May 8th this year. We have the 3rd grade readers rescheduled to come out if the rain holds! Nothing warms our hearts more than seeing children connect with and enjoy our rescue animals. Thank you to all the volunteers that help make this event possible! 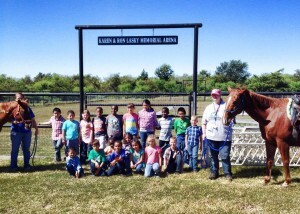 True Blue Animal Rescue had some small visitors over from Alton elementary school to view some T-bar horses and learn about animal health care on April 10th. Even though the clouds threatened to drop rain that Friday, the kids and T-bar volunteers managed to complete the whole day of planned activities and treated the kids to a great deal of fun before the sky finally opened up. The day started with True Blue Animal Rescue founder and president, Melanie Deaeth, teaching the class the proper way to behave around horses. Rules like those about not patting noses, or walking behind horses were taught. As the children were learning about horse care, the T-bar mascot, Willie the barn cat, decided to sit in and listen to the lesson. Willie, who adopted T-bar as his home many years ago, is always a huge hit with visitors, big and small, that come to T-bar. 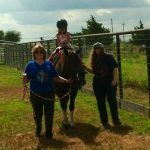 Once the lesson on horse care was done, the group of kids were split up; a few stayed with Melanie while the rest of the children were treated to a famous Dale Deaeth hay ride! Though it was cold, Mr. Dale, as the kids call him, had blankets to keep the kids nice and warm and they took off on an adventure. While one group was off enjoying the countryside, the other set of students had the pleasure of meeting camp horse Jasmine. 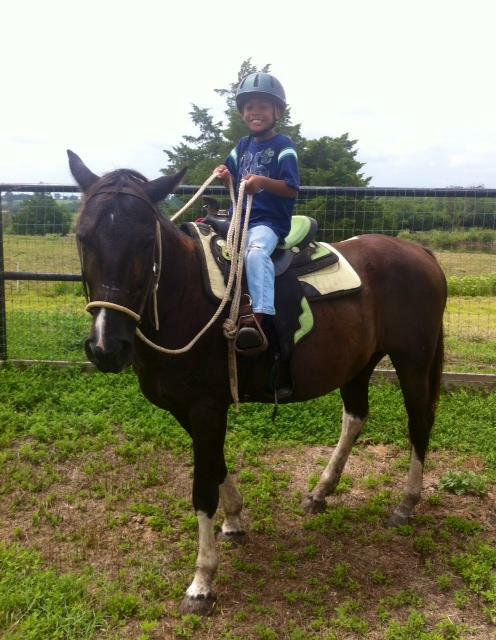 Jasmine is a very special horse that was struck by lightning as a pony. Somehow she survived but she lost her gift of sight. 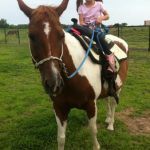 Still, when the kids first meet the horse they have no clue she cannot see as she gets around so well and is very trusting with T-bar volunteers. Jasmine loves when she hears kids on the grounds because they give her treats from the treat bowls at the barn. New to the T-bar ranch is Roman, a beautiful black Percheron that was taken in just two months ago. The Percheron breed is in league with draft horses, or warm bloods, which are typically large horse breeds. If you wonder at how big these horses can be, I always tell people to think of the Clydesdale horses used in Budweiser commercials. The reaction of the kids as Roman was pulled from his stall was priceless. The kids were excited and a few were a little nervous. But as with most draft horses, Roman was gentle and sweet as pie. He too was treated to horse cookies and then the kids even took turns brushing him. 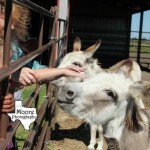 Once Roman was put away, the kids formed a line to see miniature donkeys, Dolly and Madison. 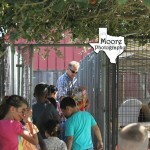 They too were given treats and the kids enjoyed their small stature. 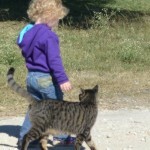 At times, the tour led the class away from the barn, but Willie the barn cat always made sure to stay nearby! 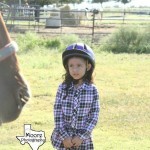 After looking at the donkeys, the class then headed over to look at the big pasture of horses. All the kids loved seeing Zelda, the zebra/horse hybrid, and the many other horses at T-bar ranch that need homes. 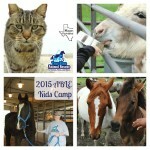 True Blue Animal rescue would like to thank all volunteers that helped make this camp day possible. From those that came the night before to groom horses and clean the barn, to those that came to help the kids and handled the horses. Without you, days like this one would have been impossible. Thank you! Fall Family Fun Day 2014! 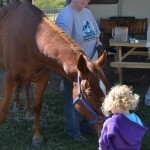 Another one of our Animals Bridge Love and Educations (ABLE) days was Family fun day on Nov 1st. 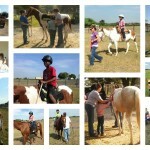 The kids enjoyed horse rides, a hay ride and feeding and petting animals. Nothing brings us more joy than sharing our rescue animals with children. 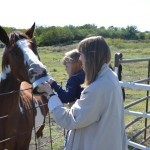 This opportunity for a family to come out and enjoy a few hours at Tbar Ranch is one of our favorites! These pictures say it all! 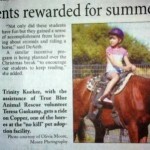 Kids Who Read Get To Ride a Horse! 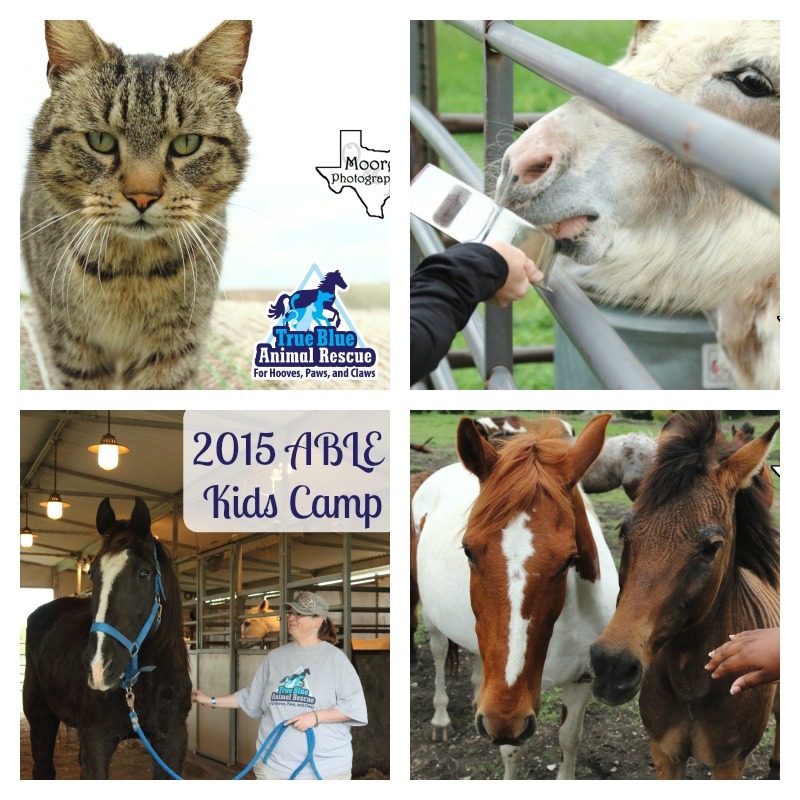 TBAR is proud of the advances our Animals Bridge Love and Education (ABLE) program. Each season we offer incentives for children to earn an animal experience through reading their choice of books. This October we hosted students from Alton Elementary (in Brenham, Texas) who read 30 picture books or 50 pages of a chapter book while they were on summer break. In total, seventeen students met the challenge requirements by handing in their list of books, endorsed by their parents. They were all so exited to embark on their special reward: a field trip to the home of one a TBAR foster family (and a teacher at Alton), Melanie! Melanie and her husband Dale work hard to organize these trip and ensure there are plenty of TBAR volunteers on hand to help the students meet and pet the animals while learning about care and compassion for the animals. 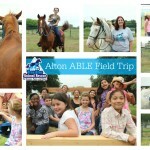 The kids got to tour the ranch, feed animals, ride a horse, and go on a hayride! TBAR will continue to support the ABLE program and spread love and compassion for animals throughout Washington County and beyond. Thank you to the parents and teachers who support the program, and the TBAR volunteers that make it possible! 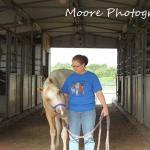 True Blue Animal Rescue had the pleasure of hosting the Five Oaks Achievement Center on August 13th and August the 15. From nine am until noon the kids that came out were treated to a number of fun T-bar events. The day started with the introductions to the horses they would be working with along with the many rules about how to behave around a horse. Melanie DeAeth, founder and president of True Blue Animal Rescue made sure the boys and girls that came out got hands on experience working with the animals. 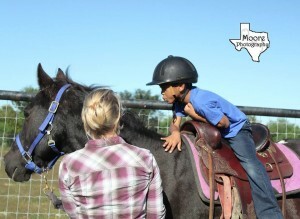 Not only did the horses get one on one attention but so did the kids that came out. Thanks to our wonderful volunteers each student also had a teacher for the day. 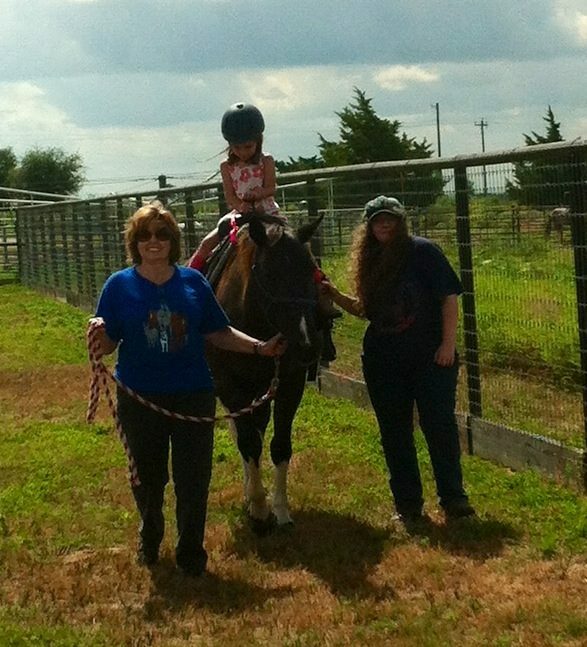 While one group went off for a nice hay ride around the T-bar ranch the next group was assigned a horse and a volunteer. 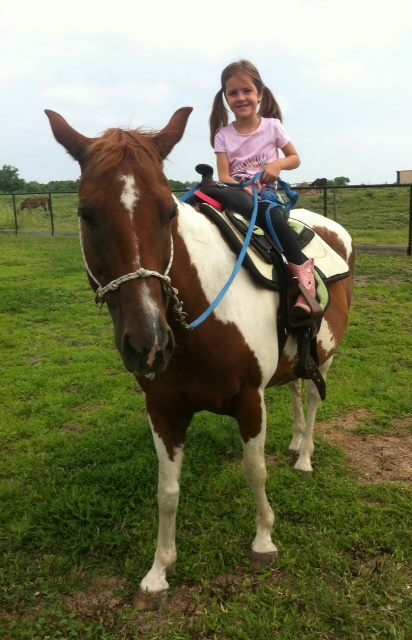 First they were taught how to groom a horse and the proper brushes to use on what part of a horse’s body. 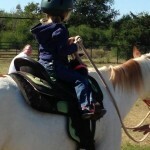 Next was the even tougher lesson of putting on a saddle! That one was a little more involved! 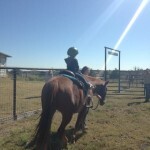 Next the kids got to walk their horse to the round pen to learn very basic ground work skills. 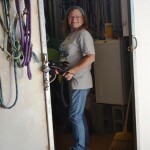 Melanie directed the group with first putting on a rope halter, then making sure the horses were okay with the lead line moving near the horse. Also known as desensitization. While doing these skills the teens came out of their shells and had fun asking questions about their horses and even about life. 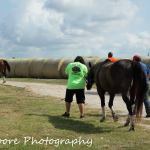 Once round pen work was over the group then were asked to lead their horses to the True Blue Animal Rescue riding arena. There, with their special volunteer for the day, the kids were able to pick out a riding helmet and then be led around the arena for riding. A few of the kids were not certain they wanted to ride but with a little cheering on everyone gave it a try! By the end of the day all the teens that came out were cowboys or cowgirls. After the riding the volunteers demonstrated how to take a saddle off a horse the proper way and store it. Next the kids rubbed down the horses and all too soon they had to say good-bye. 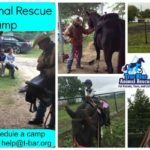 True Blue Animal Rescue would like to thank the people that sponsor camp horses and the volunteers that came out on the days that Five Oaks was with us on their visit. Without your help and support, events like this would not be possible. Thank you so much and to the kids from Five Oaks, we hope to see you again. 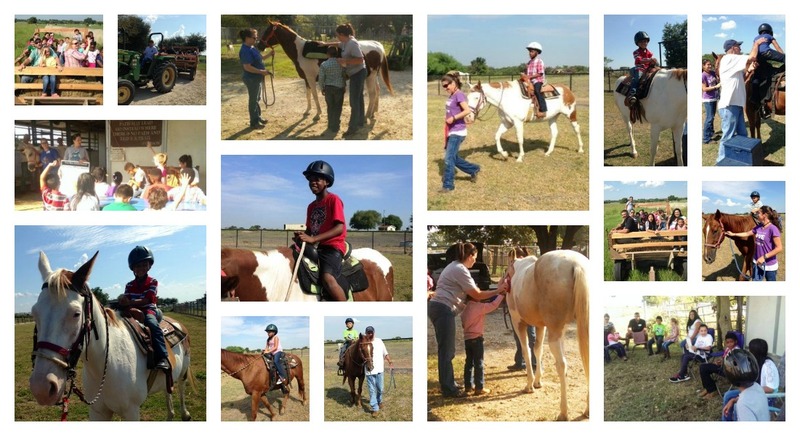 Our Read to Ride Program was lots of fun this summer! Children aged 6 – 10 who read books over the summer were able to come out and learn about and ride a horse. The kids had lots of fun and so did the volunteers! This program was offered during the month of July and time slots filled quickly. 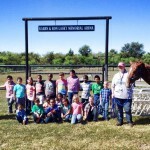 The kids were excited but apprehensive when they arrived but after brushing, saddling and then riding a horse they had gained confidence and pride in their accomplishment. We plan to extend this program to include children up to 12 years old next summer so watch the web site for announcements in the spring. Those who want to attend more than once can do that for a $20 donation to Tbar. 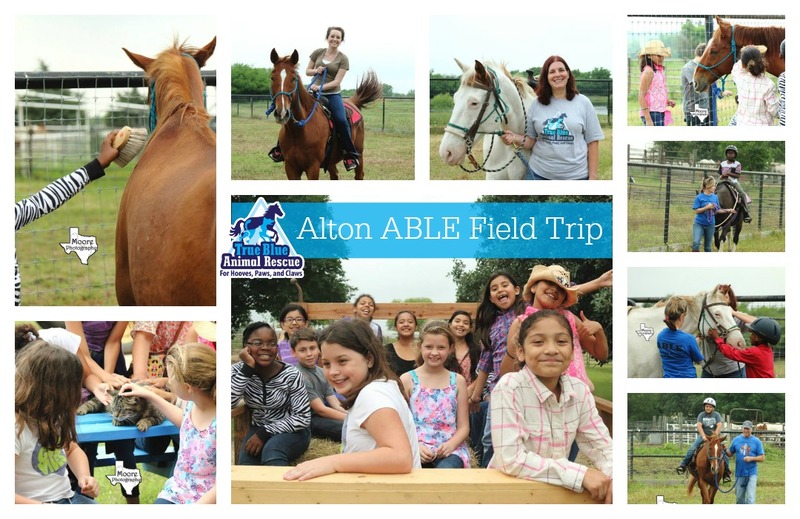 As another incentive to read we will have a field trip come out from Brenham ISD for all the students at Alton Elementary who read and kept track of the books they read over the summer. 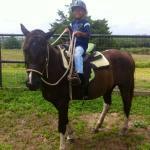 We also have plans for horsemanship classes in the spring so keep watch for updates and announcements on that too. Reminder: Our Read to Ride ABLE kids camps are filling up fast! 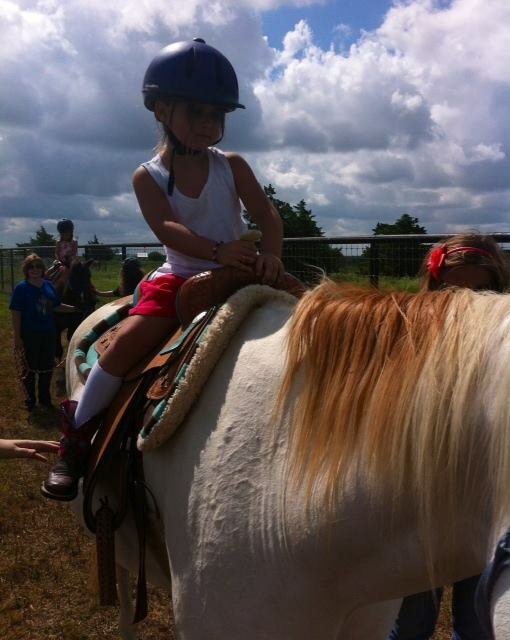 Remember to register ahead of time for your kid to get their 30 minute horse experience. 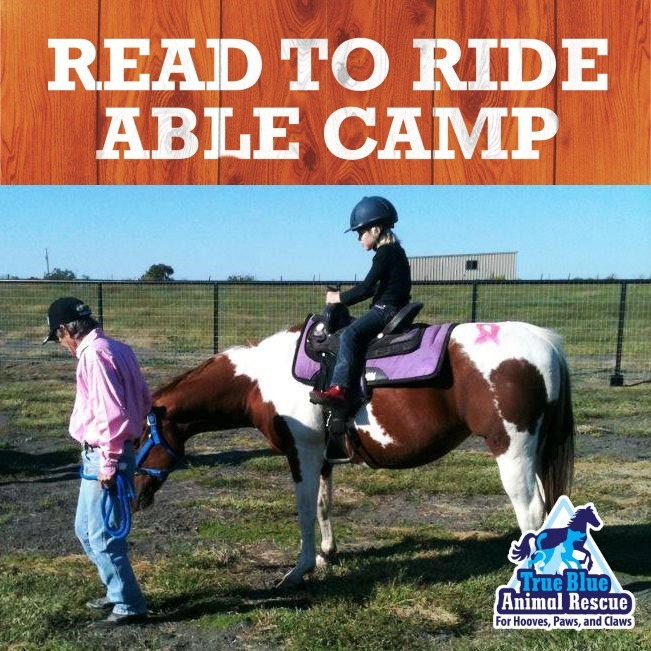 AND don’t forget, kids can turn in their read to ride ticket once they complete 5 books this summer for one free horse experience! You can pick your date and time and register HERE at Eventbrite!